Originally uploaded by foto d.
I just read the sad news. 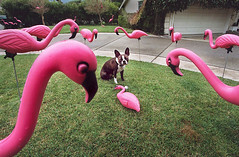 They’re closing the original pink flamingo manufacturer! Strangely, I feel sad. I never owned one. I guess I always felt comforted that they were there if I ever wanted to own one (or a dozen). I wonder if they’ll stay iconic.